Baseball is a game of endless numbers and statistics, but here's a line you've probably never seen before: From May 2005 through last May, Albert Pujols hit .527 (39 for 74) in 22 games, with 12 homers and 25 runs batted in, following events in which he interacted with people with Down syndrome. "It uplifts the kids, but I think it uplifts Albert even more," said Todd Perry, the Pujols Family Foundation chief executive who researched those numbers. "It's amazing how good he plays when he's around these kids." Pujols, the former St. Louis Cardinals star who signed a 10-year, $240-million deal with the Angels in December, is around one of those youngsters all the time. The oldest of his four children, Isabella, 14, has Down syndrome. She was a toddler when Pujols adopted her after marrying her mother, the former Deidre Corona, in 2000. "From the moment he met her," Deidre has said, "she stole his heart." Bella, as she's called, was the inspiration behind the St. Louis-based foundation that Albert and Deidre started on May 5, 2005 — 05/05/05 — Pujols' jersey number in triplicate. The foundation's primary focus is to enrich the lives of families of children with Down syndrome and to minister to impoverished families in the Dominican Republic, where Pujols lived his first 16 years. Pujols received a relatively small bonus of $60,000 after being picked in the 13th round in 1999 and made $125 a week in his first minor league season. But after winning the 2001 National League rookie of the year award and quickly establishing himself as one of the game's premier sluggers, Pujols in 2004 signed a contract that would pay him $111 million over eight years. That gave him the financial means and platform he'd always wanted in order to make a significant impact away from the field. "The focus on Albert was on home runs, runs batted in, but he wanted to talk about things that mattered to him — his faith, his daughter with Down syndrome, poverty and the way he grew up," Perry said. "That stuff was falling on the cutting-room floor. That was a huge reason for them starting the foundation." In 2001, the Down Syndrome Assn. of Greater St. Louis consisted of an answering machine in a mother's home. The Pujols foundation now operates out of a spacious suburban high-rise office, its walls covered by murals of Albert and Deidre working with young people in St. Louis and the Dominican, and serves 1,500 local families. In 2011, the foundation staged 63 events that included father-son fishing trips and bowling nights, mother-daughter teas, cooking, theater, music and dance classes, all-star basketball and baseball games, and a celebrity golf tournament. The highlight of the year is a prom, which last fall drew 500 young people, many of whom wore tuxedos and formal dresses, rented limousines and posed for portraits. 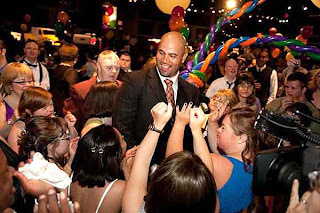 Pujols rents a hotel ballroom for the event and tries to dance with everyone. "Some of these kids are 25 years old and have never been on a date," Perry said. "They get to ask out a sweetheart, someone they have a crush on, and they have somewhere to go." The foundation has expanded its efforts in the Dominican, joining forces with Compassion International to send in teams of doctors, dentists and optometrists on annual medical relief trips. The foundation's Project Sound Asleep delivers 70 to 80 mattresses a year to people with no beds. Pujols has built baseball fields, hosted clinics and organized teams in several "batays," or shantytowns, filled with Haitian refugees and poor Dominicans. "There's no infrastructure, electricity or flushing toilets — they live in tin and cardboard shacks with dirt floors," said Perry, who has made several Dominican trips. "We bring free medical assistance to kids and adults. Everyone matters. They see Albert delivering mattresses; they see him with kids with lice, parasites and scabies, and he's loving them like they're family." Pujols didn't grow up amid such destitution in Santo Domingo, but he knows what it's like to go a day without food. "This is my passion, and I believe this is what God is calling me to do," Pujols told "60 Minutes" last year. "That was me 25 years ago. I was one of those little boys with no hope, just a dream." Though Pujols is moving west, the foundation has no plans to change its mission in St. Louis and the Dominican. Rather, it will expand to Southern California. "We have an additional place to connect with the community, to affect more people," Deidre Pujols said. "We're never going to stop loving St. Louis. We have beautiful relationships with people there." Perry, who met Albert and Deidre through church, has contacted Down syndrome officials in Orange County and Los Angeles to assess their needs. "They're a lot more evolved than St. Louis was," Perry said. "It's exciting because we get to jump on the train while it's rolling. We don't want to duplicate their efforts. That's a waste of manpower and energy. We want to partner with them." The Down Syndrome Assn. of Orange County has been affiliated with the Angels for years — its biggest annual fundraiser is a "Buddy Walk" day in Angel Stadium — but that connection is expected to now grow. "Everyone is pumped to have a great athlete like Albert coming locally to us," said Kellie Perez, a senior director with the local association. "Not everyone knows he has a daughter with Down syndrome. Because of his celebrity status, it will help create more awareness." Pujols is already receiving star treatment from the Angels, who open spring training workouts on Feb. 20. Billboards are up around Southern California proclaiming Pujols to be El Hombre, The Man. Perry can't guarantee Pujols will bring a championship to Anaheim, but he predicts the slugger will bring the same kind of commitment to the community that earned him the 2008 Roberto Clemente Award, which is given annually to the major league ballplayer who best exemplifies the game of baseball, sportsmanship and community. A replica of the bronze Clemente statuette, which Pujols commissioned as a gift to Perry, sits on a coffee table in Perry's office. "The Angels got one of the greatest hitters of all time, but the best part of this man is not what's on the field," Perry said. "What he'll do in a community, how he'll bring himself and his heart to Southern California will be the best gift of all."